My Rahu transformation is finally live on Youtube after months of planning and preparation while traveling abroad and living in a foreign country. It’s so fascinating to me how every time I transform myself into a planet I receive the full experience of what that planet is all about. ATTENTION: This video is one that was in need of a ⚠︎ disclaimer. As some of you may know, Rahu is one of the wildest planets. I personally have Rahu conjunct Mars in the 12th house, so for me the experience of Rahu can be quite extreme. I encourage you to watch the video or read the rest of this post only if you are comfortable with seeing photos of me without too much clothing on! 1. Uncharted territories. Rahu is a part of the army and therefore rules uncharted territories- those areas that are yet to be conquered. I feel that this is the most important attribute to mention first and foremost! Rahu forces us to go outside of our comfort zone, because of this I really tried to push myself for this video. Rahu is in my 12th house with Mars- so I was able to push myself pretty far! Most of the choices that I made for hair, clothing and makeup were choices towards going as far out of my comfort zone as possible, without completely offending myself. I was definitely outside of my comfort zone in clothing, accessories and dance. 2. Dark color.The first thing I wanted to represent was the dark color as mentioned in the quote above. To do this I chose very long, draping, dark hair and black accessories such as the choker and boots. I also wore black eyeliner to darken the makeup and used that same liner as a lipliner to darken the lips as well. For the preparation I used a charcoal colored face mask. This description made it really easy to choose the main color for Rahu. Rahu being dark is also representative of the evolutionary path of the soul which often hard to navigate due to its obscurity. There is always something hidden when it comes to Rahu. He brings fear through us being uncertain of what’s to come. 3. Gaping Mouthed. I didn’t leave my mouth gaping for the entire video, but I definitely got some good shots holding a gaping mouth as described in the quote above. This is one of the characteristics that I couldn’t find much information about. I would love to know more about why Rahu is Gaping mouthed, but I personally feel that this could be another visual representation of Rahu’s cruel nature as well as descriptive of his obsessive and hungry qualities. Svarbhanu, the serpent that was cut in half to form Rahu and Ketu was trying to drink amrita, the nectar of immortality when he was cut in half after all. Perhaps the gaping mouth shows this thirst for amrita. 4. Chandala. Rahu’s caste is “chandala” which literally translated means “the worst.” Rahu rules anyone who is of little to no benefit of society. This was a huge inspiration for me while choosing the general overall style of Rahu. I wanted to make her a little bit more punk and grunge to give her an “anti-society” vibe. In the end she kind of ended up looking a bit like an 80’s chick, but that works just as well! 5. On a Lion. This photo also shows a lion patch. Rahu’s mount is a lion. I wasn’t able to find many explanations of why Rahu’s mount is a lion except for in the work “The Rahu & Ketu Experience” by Prashant Trivedi. You can check out the entire description of why he proposes that Rahu is related to the lion by reading the book, but to summarize he states that Rahu in fact behaves like a lion, being quite lazy when he is not hungry and acting very ferociously when he is hungry. 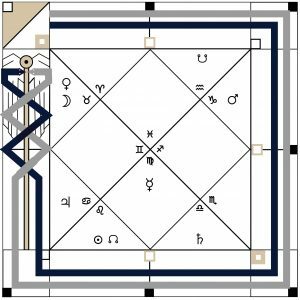 In our charts Rahu can lazily delay manifestation. In the same way Rahu experiences can be quite intense- just like the lion when hungry. Lions also pounce upon their prey quickly and unexpectedly and so when Rahu actually does manifest he often do so in shocking and unforseeable ways. We are rarely able to predict the events that Rahu brings into our lives. Ask anyone who has run their Rahu dasha! I also want to note that most astrologers relate Rahu to a dark or black lion. I just chose the best patch I could find for my vest. The darker lion would have been better as it describes an association with other deities that help to explain more of Rahu’s complexities. 6. Cruel. I have had a lot of fun showing how cruel the planets can be! Cruel planets offer their wisdom and opportunities for evolution by being tough on us. First and foremost, I used this description to help direct which type of style to adorn Rahu in. Then I made Rahu’s cruel nature more obvious by choosing spiky jewelry like claws and a choker, darker makeup and intimidatingly tall boots. I also chose a cruel expression for much of the clips. 7. Rahu Sanivat. This means that Rahu behaves like Saturn. This added to my decision to have darker hair just like Saturn in my Saturn makeover video. I also decided to have Rahu wearing a choker as Saturn constricts. 8. Conspicuous. In the Graha Sutras, Ernst Wilhelm outlines the makeup habits of each planets. For Rahu he mentions that Rahu would wear strong colored, conspicuous makeup and may even wear too much makeup. Rahu would also wear makeup to patch blemishes. This is why I chose to “color correct” Rahu’s face using a color correction palette. It is also one of the reasons why I chose a rainbow eye shadow look for Rahu. I also added many bright colors to the vest that I made as well to make it stand out more. 9. Illusions. Rahu is the planet of illusions. For this reason many astrologers have related Rahu to rainbows, which are an optical illusion of light reflecting through moisture in the air. Rainbows have often been associated with serpents in many aboriginal cultures including tribes in Australia and Haiti. This is perhaps another reason why Rahu has been a karaka for rainbows. This is why I chose a rainbow inspired eye look for Rahu and why I used more color in the editing and in the creation of the vest. monarch butterfly: Rahu is the shadow planet of illusion and manipulation, any conspiracy enthusiast might already know about something called “monarch programming.” People believe that some famous and influential people are put through monarch programming which is essentially a form of mind control. I thought the monarch as a symbol well represented this intense form of manipulation. It also represents transformation which is another indication of Rahu. seashell & pearl: In Western astrology Rahu and Ketu are known as the nodes of the Moon. I wanted to put a little nod to the moon on the vest which is why I chose a seashell as the Moon is what affects the tides. I also added the pearl as in Vedic Remedial Astrology a pearl is often prescribed during one’s Moon dasha. 11. The Head of the Serpent. As you have seen Rahu and Ketu are a serpent that was cut in half according to vedic mythology. Rahu is the head of the serpent whereas Ketu is the tail. I chose to decorate the vest with drawings of two full serpents as that is what most inspired me, but originally my outfit was a bikini made of two cobra head patches and string- it was a little bit too wild to wear! I also used the serpent theme to inform my choice of fabric when choosing the top for Rahu as well as the shorts. The fishnet of the shorts reminded me a lot of the scales of a snake as did the pattern of the top. Very obviously, the lip pattern I chose was also inspired by Rahu’s serpentine nature. I think it is fascinating that Rahu and Ketu, the north and south nodes of the Moon are depicted to be a serpent. In all of my studies I have found serpents to be very much representative of the feminine. They are cold and cannot create their own heat and therefore must rely on an external heat source just as the moon relies on the heat of the sun. They also tend to burrow themselves in dark places underground. I think that Rahu and Ketu being related to the serpent symbolism shows their connection to the feminine aspect, in this case, the Moon. 12. Poisons. Alongside Rahu’s association with snakes we see an association with poisons. Many snakes contain poisonous venoms which can often kill, but have lately been found to heal. Oftentimes Rahu will bring poisonous situations in our lives that are really their for our own healing and evolution. I showed Rahu’s association with poisons by drawing a skull and crossbones onto a bottle of kombucha. Interestingly, Prashant Trivedi relates Rahu to vinegar which makes this association even more exemplative of Rahu’s symbolism! 13. Smoky. In the second quote we see Rahu mentioned as being “smoky.” This description likely comes from Rahu’s characteristic nature of veiling things, hiding things, making things barely visible as if behind a cloud of smoke. They also create mystery with anything they influence in the birth chart. Additionally, Rahu can bring an addiction to cigarettes to those with Rahu negatively influencing their second house. For this reason I chose to have Rahu smoking a (fake) cigarette. I also made the eyeshadow smokey even though it was quite colorful. My intention was also for their to be a smoke machine, but time did not allow for me to find one. 14. The Seizer. Rahu and Ketu are referred to as grahas and not actual planets. In fact all of the planets can be called “grahas.” Graha means one that “siezes” or “grasps.” Since Rahu and Ketu are very specifically not meant to be called planets and are technically only regarded as shadow planets or grahas, I thought I would give a special shout out to them by using a hair claw that literally siezes and grasps the hair during the beginning clips of the video. 15. Terrible. Rahu is supposed to be “terrible.” Rahu can create the greatest tragedies and traumas that one can experience or at the very least create some of the biggest shake ups that we can imagine. I energized the video with some terrible features, that I thought might even turn people away from watching it- some clips are a overly risque, I stick out my tongue and in many clips am trying to play up a punk vibe. This wasn’t the easiest thing to portray, but I did my best! 16. Transformation. Rahu is a graha of transformation and evolution. All of the makeover videos I do are transformation videos. However, I added a special clip in this one of me spinning in a chair and turning into Rahu in one clip to bring out this special little detail. 17. 8. Rahu is related to the number 8 in numerology, including the Cards of Truth system. This is why I chose a number 8 tattoo, which also happens to be an infinity symbol. 18. Reincarnation. Speaking of infinity. Rahu and Ketu together symbolize the process of involution & evolution that we must take in order to achieve moksha or liberation from the cycle of rebirth. They are hugely related to reincarnation. This is also another reason why I chose the infinity symbol as my tattoo. 19. Skin Afflictions. Rahu rules over any strange kind of skin afflictions a person might suffer. This is why I chose a tattoo for Rahu, this might have also been due to the fact that I have Rahu conjunct Mars (needles and sharp objects) in my own natal chart. I also ended up getting some pretty gnarly skin irritations from the gems on the vest I made as my skin is quite sensitive. I decided to keep the clips in the video that show the irritation that the vest left on my upper back. 20. Beautiful Metalwork. In order to propitiate or please Rahu one should use beautiful metalwork. I didn’t find beautiful metalwork for my version of Rahu, but I did choose many metallic details in the dress and jewelry for Rahu. 21. Ecliptic. Rahu and Ketu are the intersection points of the path of the Sun and Moon also known as their ecliptics. I chose to demonstrate this visually with some gold earrings that are literally two hoops that intersect. 22. Obscuring. Rahu is a planet that tends to obscure all that it influences. This can make it hard for us to see our path. I explain a bit about this in a video I recently put out on Nadiya Shah’s channel, which you can watch here. To show this obscuring influence I had many shots where my hair or hands were obscuring Rahu’s face. FINAL IMAGE OF RAHU ☊. Downward Facing. Being a downward facing planet naturally causes a bit of sleepiness in a planet. In Rahu’s case this sleepiness brings a connection to the subconscious where Rahu has access to all of her fantasies and delusions. Rahu can make one fixate on their fantasies to the point of believing them to be true. I chose a downward facing look for Rahu’s final image, which also showcases her mystery & darkness. Rahu would be found in the corner. I wanted to place Rahu in the corner of a club wearing a crazy outfit as Rahu and Ketu are both found in a corner, but Rahu would attract much more attention to herself. Rahu as well as the other cruel planets would also be found in forested mountains. Unfortunately there were no forested mountains near any of the places I was at the time of shooting this video. Rahu as well as the other cruel planets also rule places and substances that are natural according to the ancient texts. I found this interesting as Prashant Trivedi had mentioned Rahu related to synthetic materials. Since Rahu is also related with illusions I didn’t stick to this “natural” dress code or product code and was a bit more flexible with what I adorned Rahu with. Rahu would be smoky, unclear and not fully distinguishable. I wanted to give Rahu a complete “look,” so I made sure that you could see some shots of her full face, but I favored many of the clips and photos where Rahu is obscuring her face somewhat. This is a really important aspect of Rahu, but was not as easy to portray without completely obscuring all of the details of the look. Some more “smoky” or blurry shots were something I wanted to achieve with a photographer, but was unable to for this shoot. One interesting thing to note was that it was really hard to edit this video, because I was hardly ever fully in the frame! ✧ To learn more about the planets, please check out the fantastic book, Graha Sutras by my teacher Ernst Wilhelm. You may also check out the other astrological makeovers in this series, by visiting my Youtube Channel Listen to the Stars. My name is Nicole Brenny. I am a jyotishi, tarot reader and life coach. I have over 17 years of experience reading tarot, I am a certified Ayurvedic Astrologer under Dr. David Frawley & currently study The Cards of Truth under Ernst Wilhelm. You may book a reading or coaching session with me here. This site is a sister site to my Youtube Channel Listen to the Stars, visit it here.